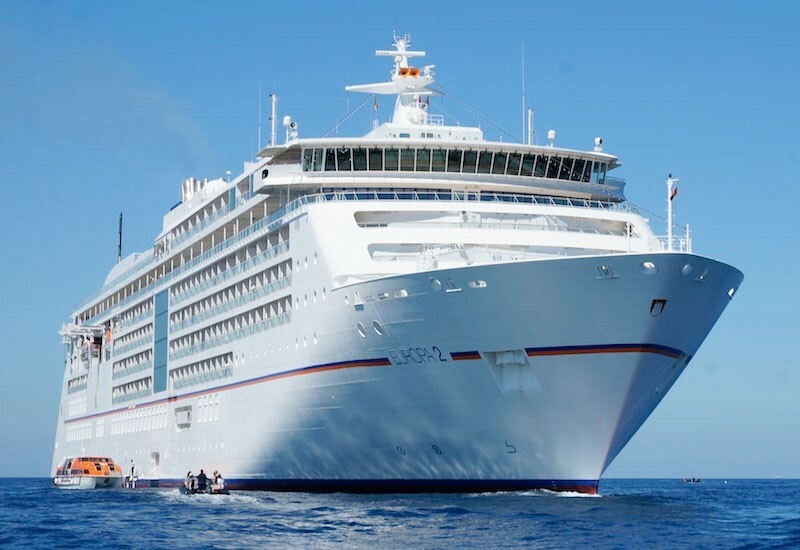 The port to the south of the island is the starting point for your cruise on board the EUROPA 2. The ancient archaeological sites of Knossos* still clearly illustrate the magnitude and splendour of Minoan culture. Visit the mountain village of Kritsa* with its picturesque alleys and the island fortress of Spinalonga*. For a more active alternative, hike* along Mirabello Bay and enjoy the impressive panorama. Explore the old town and the Palace of the Grand Master at your own pace. Enjoy the magnificent view from the acropolis of the small village of Lindos*. Or take a fish and seafood cooking course* to enhance your culinary skills. With its white-and-blue cube-shaped houses, Thira looks like it has been taken straight from a postcard scene and is one of the prettiest towns in Greece. Enjoy some hours of relaxation and take in the island’s beauty on board an exclusive catamaran*. Take a journey through time on the uninhabited island and explore at your own pace. Visit the ruins of what was once an important city. The island with its famous windmills and the picturesque harbour area of Little Venice with its Venetian-style architecture and numerous boutiques are just waiting to be discovered. Follow this up with a relaxed evening and a sundowner in one of the rustic tavernas. Pure romance awaits you as you make an individual shore visit to the capital. Visit the island’s typical shops, the historic castle ruins or the elegant harbour promenade. One of the island’s highlights is Achilleion*, the summer palace of Empress Elisabeth with its extensive gardens. A delight of sweeping green – Corfu’s coast looks almost like Italy here. A walk through Corfu Town* will lead you into the old town, which is a UNESCO World Heritage Site. Or take the plunge into the deep-blue water of the Ionian Sea with a spot of scuba diving*. Explore the main town on the island with a city tour* to see the sights – or choose a trip by all-terrain vehicle*, which will take you away from the main routes. Alternatively, you can set sail for the small islands off Hvar by sea kayak*. A guided walking tour* will take you to the Doge’s Palace, the Rialto Bridge, St Mark’s Square and through the stone labyrinth of the lagoon city. For a romantic highlight, take a gondola ride* through the canals to finish your cruise with the EUROPA 2 in style.